Rabbi and author of the sixteenth century; styled by Azulai "Ir weḲaddish" (Angel and Saint); a pupil of R. Joseph Sagis, the colleague of Joseph Caro. He lived at Safed. Ascari was a founder of the "Sukkat Shalom" (Tabernacle of Peace)—a society devoted to religious meditations—and wrote in its interest in 1585 his work "Ḥaredim" (The Devout Ones), which deals with the three principles of religious devotion: the knowledge of God, the strict observance of His commandments, and penitence. The section on the Commandments deals separately with the mandatory and prohibitory laws, and includes also those that can be observed only in Palestine. In the section on penitence, Ascari expresses his opposition to unnecessary fasting as a means to repentance. The work is permeated by a spirit of broad humanity coupled with humility and holiness. Although Ascari understood the Cabala, and was personally acquainted with Isaac Luria—whom he describes as "our holy cabalist, on whom the Holy Spirit rests, as he speaks so wondrously "—he can not be counted among the cabalists. 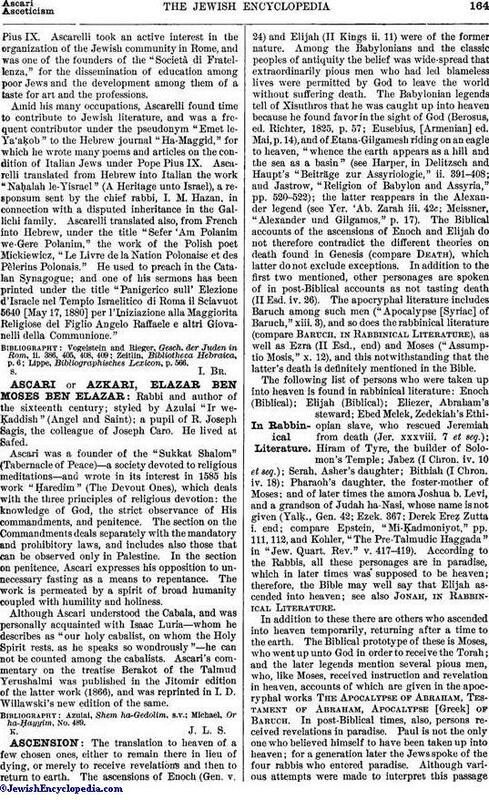 Ascari's commentary on the treatise Berakot of the Talmud Yerushalmi was published in the Jitomir edition of the latter work (1866), and was reprinted in I. D. Willawski's new edition of the same. Michael, Or ha-Ḥayyim, No. 489.